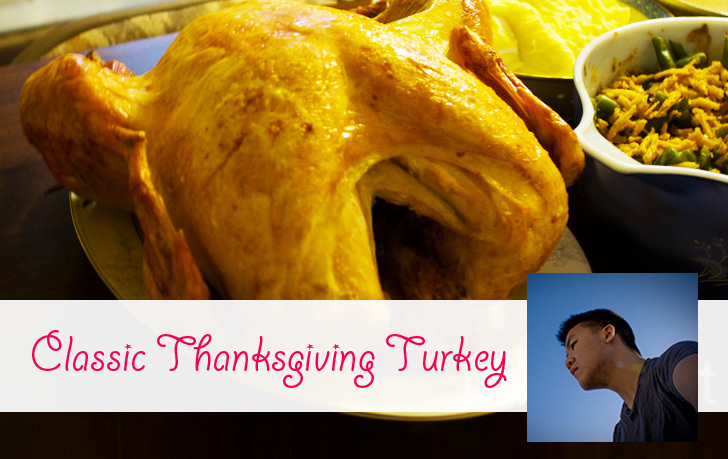 Here at Inhabitat, Thanksgiving tops the list as one of our favorite holidays. Not only is it a great time to reflect on the year and give thanks for all the great things that have brought us happiness, but it also gives us a reason to shamelessly chow down on some seriously yummy seasonal fare! This year we asked our team of writers and editors to share their favorite Thanksgiving Day recipes. From drool-worthy savory dishes to scrumptious sweets featuring pumpkin and bourbon, read on for all the delicious dishes, and get inspired to make one (or a few) for your dinner table this Thursday! I grew up with steamed Brussels sprouts and they were awful; the watery little gooballs dissolve into mush the second you take a bite. It wasn’t until I revisited them a few years back that I realized the cruciferous mini cabbages stand up brilliantly to heat – a quick sauté in a hot skillet renders them tender and flaky with caramelized bits of char. The trick is to use a hefty pan (cast iron works wonders) and preheat it on high for 30-60 seconds until it’s scorching. Next drop in the oil, butter, salt, pepper and sprouts, stir to coat, and DON’T TOUCH them until they’ve turned golden brown (usually about 5 minutes). Once they’re seared on one side, shake up the whole pan and let it sit again to continue building up caramelized bits. 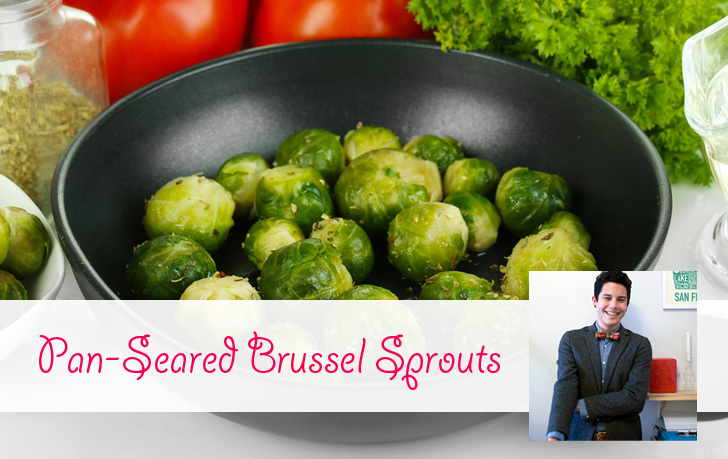 Once they’re nicely browned, add 2 tablespoons of water and cover with a pot lid for 30-60 seconds – the steam produced will cook the sprouts through and leave them tender with a slight bite. A lot of families are loyal to their favorite, time-tested Thanksgiving recipes, so there may be a lot of reluctance to try anything new. But that doesn’t mean you can’t change things up by getting creative with your presentation skills. One way to add some excitement to your T-day table is to spruce it up with an edible centerpiece like the High Line Park-themed one we made last year using leftover sushi boxes and chopsticks. Copy our tutorial or adapt it for a work of foodscape architecture that will blow your relatives away. I’m not a huge fan of the heavy foods that come with the holidays—I much prefer lighter fare, even if it is the time to indulge. This recipe here is one that I’ve integrated into my annual Thanksgiving dinners. I learned to make this delightful dish from an elderly Italian man while I was living in Milan years ago. It’s one of my favorite pastas to make—not only because it’s mind-blowingly good and not too heavy, but because it looks beautiful and it’s super easy to whip up! STEP 1: In a stock pot, bring 2 qt water and 1 bouillon cube to a boil. 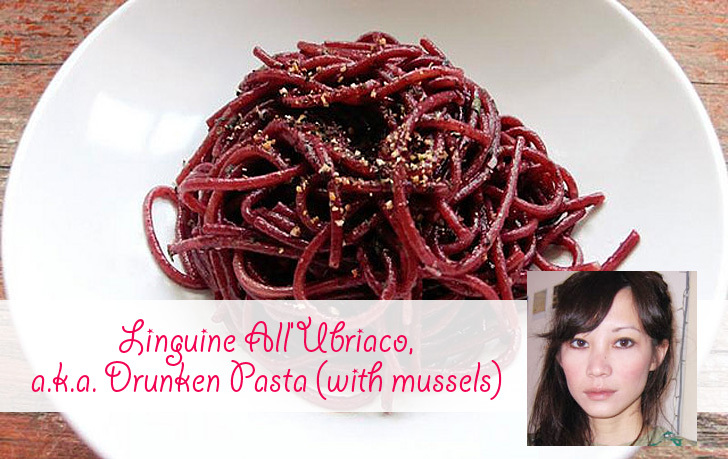 Add linguine to boiling water. Cook pasta 1/2 of the way (about 4-5 minutes), drain, and set aside. Be sure to save 1/2 c of the pasta water for the wine sauce. STEP 2: In another large pot, melt butter in oil over low heat. Add garlic, crushed bouillon, and red pepper flakes to saute pan. Saute slowly until garlic is a pale blond and sizzling. STEP 3: Add 1/2 bottle of red wine to garlic mix, then add the pasta water you set aside earlier. Turn heat up to medium and bring the liquid to a boil for 4-5 min to burn off some of the alcohol. STEP 4: Transfer the partially cooked pasta to your saute pan, along with the parsley and mussels. Toss and stir the mixture until the mussels have opened and your pasta is al dente (about another 5 minutes). I don’t cook for Thanksgiving because I usually have no idea what I’m doing half the time when I’m in the kitchen (I leave that up to my serious chef big brother!). But this is definitely a recipe I can get behind. It’s super simple and you just need fruit, liquor and salt—which, let’s all admit, we have in our pantries even though our fridges are empty. STEP 1: Heat the oven to 425°F. Put the peaches, stem side down, in a baking dish large enough to hold the peaches without allowing them to touch one another. Poke each peach with a fork several times to keep them from bursting. STEP 2: In a small saucepan, bring the water, sugar, and cinnamon to a boil over high heat. Remove the pan from the heat and stir in the bourbon, vanilla, and butter. Return the pan to low heat and simmer until the butter melts. Remove and discard the cinnamon pieces. Spoon the sauce over the peaches. STEP 3: Roast the peaches for 10 minutes, then remove the dish from the oven and brush the peaches with syrup from the bottom of the dish. Return the dish to the oven and roast until the peaches are just tender enough to pierce with a fork, about 25 minutes more. Let cool for at least 15 minutes before serving. 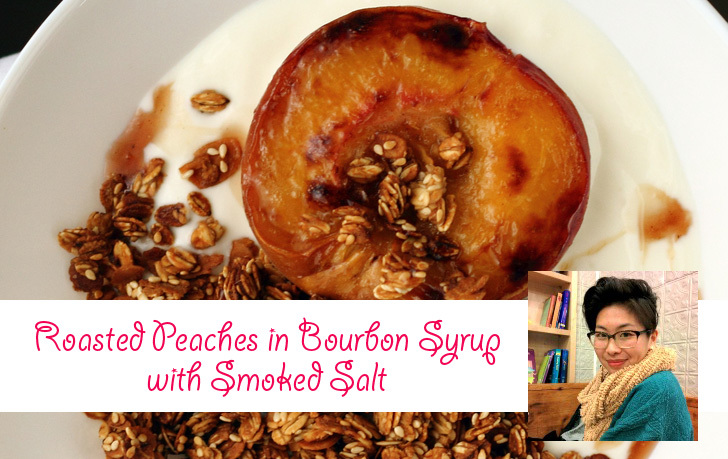 Serve one peach per person, with some syrup spooned over the top. Serve with a dollop of Greek yogurt or crème fraîche or a scoop of caramel ice cream, if desired. Sprinkle a two-finger pinch of the salt over each serving. I can never get enough pumpkin pie. Since pumpkin is so healthy, I decided to find a crustless way to still indulge. Although the dessert is still decadent, the omission of calorie-packed crust lets me focus on the awesome vitamins and nutrients in pumpkin, rather than the calories. I really love this recipe because it is the perfect dessert to make with my son during the holidays. It’s also a small portion which makes it easier to not over indulge! Preheat your oven to 350°F and add cupcake liners to six muffin holes of a tin. Add all of the crust ingredient except the butter to your food processor and pulse gently until you have thick crumbs. Pour the melted butter over the top and gently mix together. Carefully spoon equal amounts of your crumb crust to each of the cupcake liners and gently press down with your fingers. Bake the crust for 10 minutes. While the crust is baking, add the cream cheese, sugar and pumpkin puree to your stand mixer and mix well. (You can also use a hand mixer). Then, add the spices, vanilla, egg and cream and mix until combined. Pour equal amounts of filling on top of each of the baked crumb, bake in the oven for 25 minutes. Remove the cheesecakes from the oven and allow them to cool for 30 minutes before removing the cupcake liners. These little cheesecakes are perfect for any day or great for the kiddos on Thanksgiving since they are so small. You can serve with your favorite whipped topping or with organic vanilla ice cream! There are few traditional festive treats I like better than a good pumpkin pie, and this vegan recipe is particularly delicious. Its primary ingredient is obviously the ever-versatile pumpkin, but it also includes cashews to replace eggs and butter, which adds a nice nutty flavor. 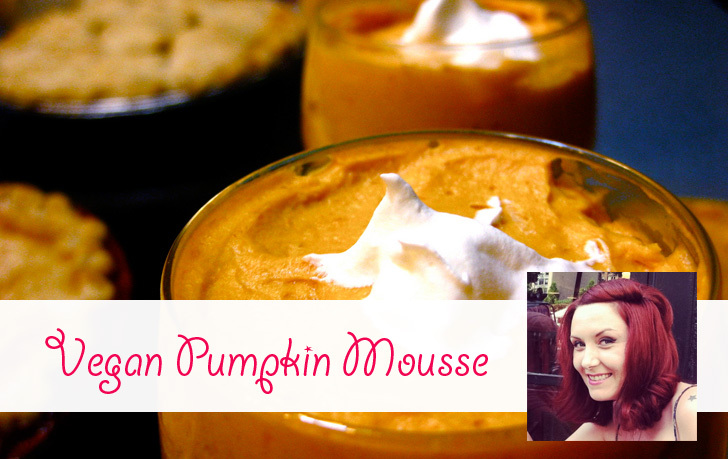 It’s quick and easy and perfect for pumpkin fans everywhere, including those not celebrating Thanksgiving! Soak 1 ¼ cup of raw cashews in 2 ½ cups water, with 1 tsp salt, and soak for 12-18 hours. Once soaked, preheat oven to 400 degrees. Drain the water from the soaked cashews and blend with food processor. Add one can of organic pumpkin puree, 1 cup maple syrup, and 2 tsp pumpkin pie spice to food processor and blend until smooth, adding salt to taste. Pour mixture into pre-made vegan pie shell and bake for 15 minutes at 400 degrees, then 35 minutes at 350 degrees. Cool and serve! Making a thanksgiving turkey can be complicated between brining, basting, stuffing, smoking, frying, and even more complexities. If you just want a bird that’s easy, brown, and delicious, this has always been my go to recipe. It doesn’t require any brining, flipping, or even any seasoning because the salt pork just drips all the fat and salt you need to keep the turkey moist. Over the past year I have been consciously trying to include more raw vegetables, fruits, flowers, seeds and roots into my diet. My life as a freelance writer is a bit unorganized, but every Wednesday I make sure I go to El Galpón, in Buenos Aires, to get my ´prana´ / ´qi´ / ‘life force’. Three lovely ladies sell locally produce, seasonal, amazing stuff that is also organic — without the need of certification. I love experimenting with food and taking photos, so working for Inhabitots have given me the perfect excuse to look more after myself and share some recipes with the world. 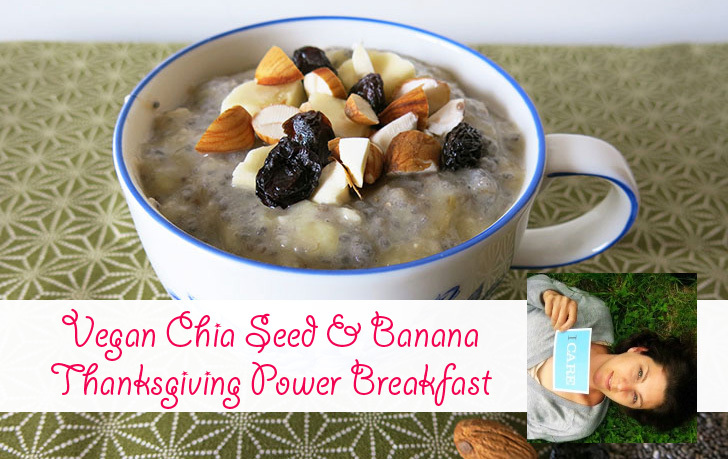 Here is a great vegan chia seed and banana power breakfast to start your Thanksgiving day with plenty of energy! 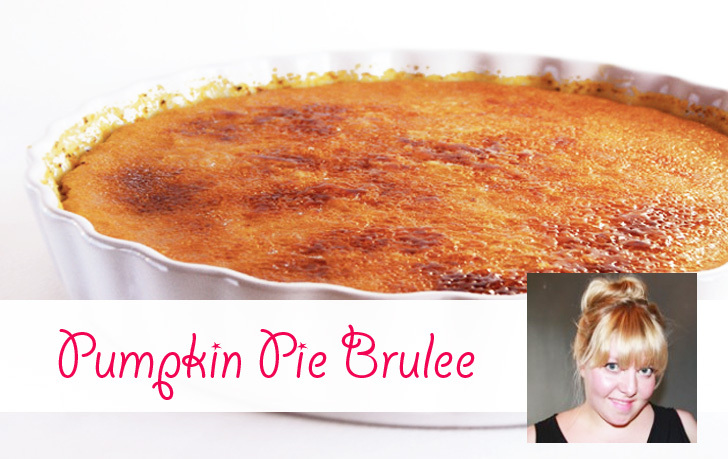 Thanksgiving is the day for indulgence and what is more indulgent than combining two of the best desserts out there: pumpkin pie and creme brulee. The pie filling is a tad creamier than traditional pumpkin pie and the crackly layer on top makes each bite a sensual experience. I use pumpkins from my garden, but the canned stuff works just as well and saves a lot of time! This will be my first holiday as a paleo eater (2 months and counting!). I’ve had so many positive health benefits (20 pounds lost and clear skin!) from changing my diet this way, but all the grains and starches that usually accompany the holiday meal can be daunting. This recipe is paleo-friendly, delivers the same silky smooth texture as the mash potatoes we’re used to, and most importantly IS DELICIOUS! Happy Thanksgiving from Team Inhabitat! Inhabitat's 2015 Thanksgiving recipes. 1 lb Brussels sprouts, ends trimmed and cut in half 2 tbsp butter 1 tbsp oil salt and pepper to taste (I like lots of pepper and italian herbed salt) I grew up with steamed Brussels sprouts and they were awful; the watery little gooballs dissolve into mush the second you take a bite. It wasn't until I revisited them a few years back that I realized the cruciferous mini cabbages stand up brilliantly to heat - a quick sauté in a hot skillet renders them tender and flaky with caramelized bits of char. The trick is to use a hefty pan (cast iron works wonders) and preheat it on high for 30-60 seconds until it's scorching. Next drop in the oil, butter, salt, pepper and sprouts, stir to coat, and DON'T TOUCH them until they've turned golden brown (usually about 5 minutes). Once they're seared on one side, shake up the whole pan and let it sit again to continue building up caramelized bits. Once they're nicely browned, add 2 tablespoons of water and cover with a pot lid for 30-60 seconds - the steam produced will cook the sprouts through and leave them tender with a slight bite. A lot of families are loyal to their favorite, time-tested Thanksgiving recipes, so there may be a lot of reluctance to try anything new. But that doesn't mean you can't change things up by getting creative with your presentation skills. 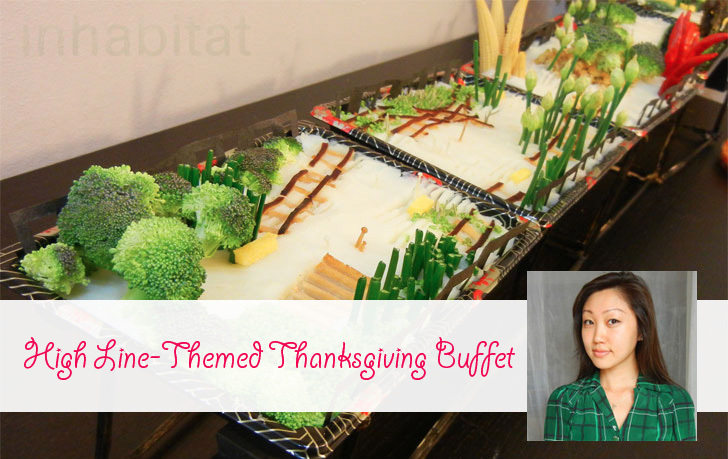 One way to add some excitement to your T-day table is to spruce it up with an edible centerpiece like the High Line Park-themed one we made last year using leftover sushi boxes and chopsticks. Copy our tutorial or adapt it for a work of foodscape architecture that will blow your relatives away. I'm not a huge fan of the heavy foods that come with the holidays—I much prefer lighter fare, even if it is the time to indulge. This recipe here is one that I've integrated into my annual Thanksgiving dinners. I learned to make this delightful dish from an elderly Italian man while I was living in Milan years ago. It's one of my favorite pastas to make—not only because it's mind-blowingly good and not too heavy, but because it looks beautiful and it's super easy to whip up! 1 lb linguine 1 boullion cube and 1/2 a bouillon cube crushed 4 large garlic cloves minced 2 tablespoons butter 1/2 cup extra virgin olive oil dried red pepper flakes, to taste 1/2 bottle of red wine (the cheap stuff works just fine) 1/4 cup chopped Italian parsley 2 lbs of fresh mussels cleaned STEP 1: In a stock pot, bring 2 qt water and 1 bouillon cube to a boil. Add linguine to boiling water. Cook pasta 1/2 of the way (about 4-5 minutes), drain, and set aside. Be sure to save 1/2 c of the pasta water for the wine sauce. 4 large, barely ripe peaches ½ cup water ¼ cup lightly packed brown sugar 1 cinnamon stick, broken into 3 pieces ¼ cup bourbon 1 tsp. vanilla extract 2 tbsp. unsalted butter Greek yogurt, crème fraîche, or caramel ice cream, for serving (optional) 4 two-finger pinches Maine apple-smoked salt STEP 1: Heat the oven to 425°F. Put the peaches, stem side down, in a baking dish large enough to hold the peaches without allowing them to touch one another. Poke each peach with a fork several times to keep them from bursting. Over the past year I have been consciously trying to include more raw vegetables, fruits, flowers, seeds and roots into my diet. My life as a freelance writer is a bit unorganized, but every Wednesday I make sure I go to El Galpón, in Buenos Aires, to get my ´prana´ / ´qi´ / 'life force'. Three lovely ladies sell locally produce, seasonal, amazing stuff that is also organic -- without the need of certification. 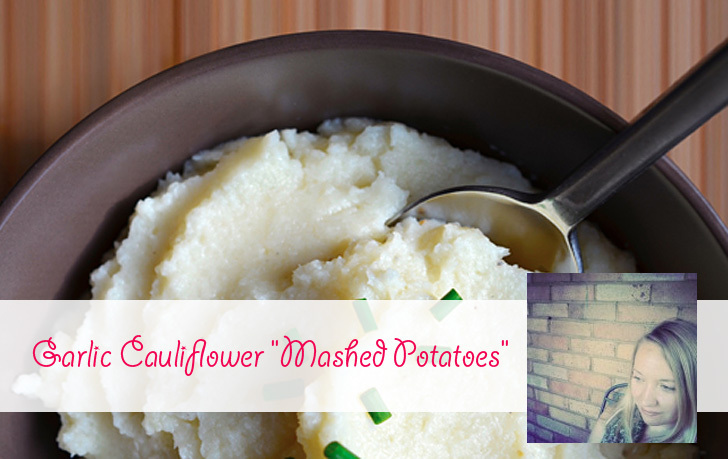 Beth Buczynski, Contributing Writer: Garlic Cauliflower "Mashed Potatoes"
This will be my first holiday as a paleo eater (2 months and counting!). I've had so many positive health benefits (20 pounds lost and clear skin!) from changing my diet this way, but all the grains and starches that usually accompany the holiday meal can be daunting. This recipe is paleo-friendly, delivers the same silky smooth texture as the mash potatoes we're used to, and most importantly IS DELICIOUS! 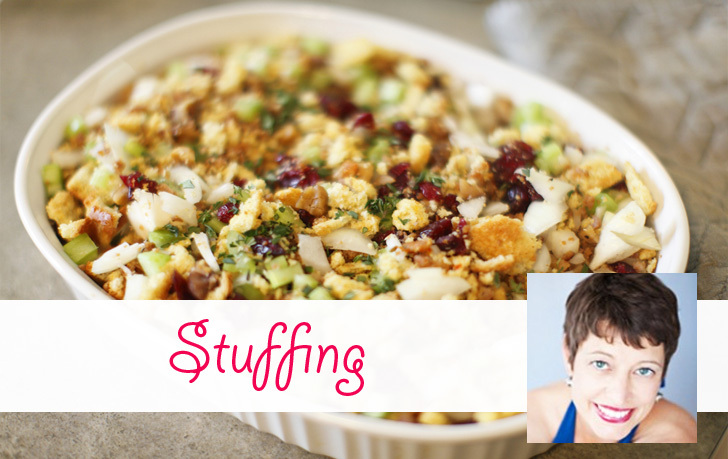 My favorite recipe is my mom's stuffing. I asked her how she makes it. " I don't have a recipe," she said." I just throw things together. Stale bread, onions, celery, sage, pepper and salt. Butter and stock to bind it all together. That's how's Mother made it." 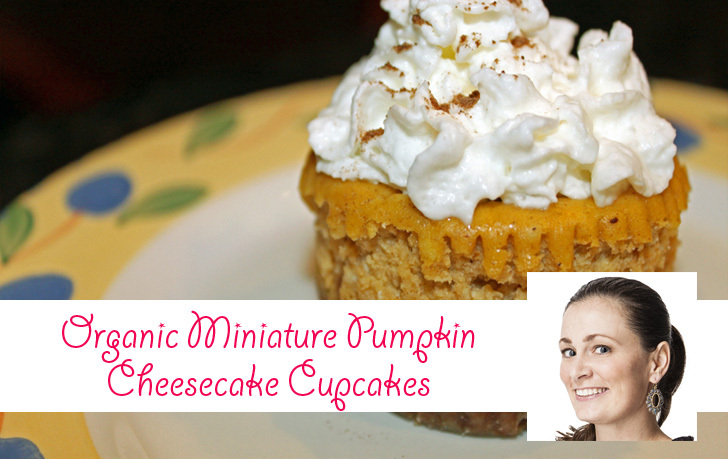 Jennie Lyon, Contributing Writer: Organic Miniature Pumpkin Cheesecake Cupcakes I really love this recipe because it is the perfect dessert to make with my son during the holidays. It’s also a small portion which makes it easier to not over indulge! For the crust: 10 organic gingersnaps 1 organic graham cracker 1 1/2 tbsp. melted organic butter 1 1/2 tsp. organic brown sugar pinch of salt For the filling: 8 ounce organic cream cheese 1/2 c. organic pumpkin puree 1/4 c. plus 3 tbsp. organic sugar 1 organic egg 2 tsp. organic cream 1/2 tsp. organic vanilla 1/4 tsp. organic cinnamon 1/4 tsp. organic allspice 1/8 tsp. organic nutmeg For the topping: Your favorite organic whipped topping or organic vanilla ice cream Preheat your oven to 350°F and add cupcake liners to six muffin holes of a tin. Add all of the crust ingredient except the butter to your food processor and pulse gently until you have thick crumbs. Pour the melted butter over the top and gently mix together. Carefully spoon equal amounts of your crumb crust to each of the cupcake liners and gently press down with your fingers. Bake the crust for 10 minutes. 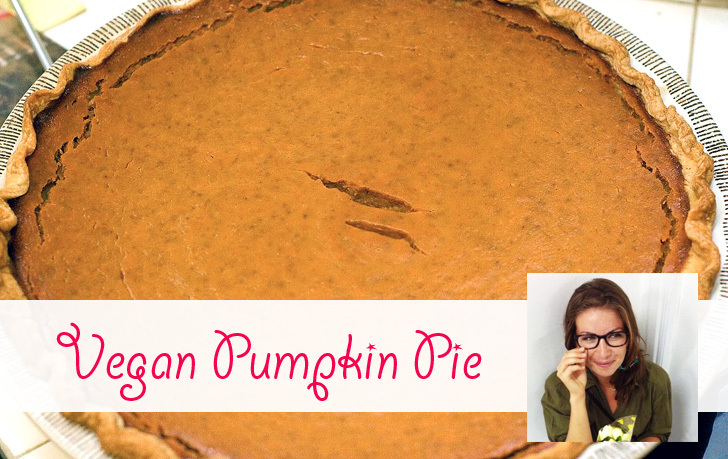 There are few traditional festive treats I like better than a good pumpkin pie, and this vegan recipe is particularly delicious. Its primary ingredient is obviously the ever-versatile pumpkin, but it also includes cashews to replace eggs and butter, which adds a nice nutty flavor. It's quick and easy and perfect for pumpkin fans everywhere, including those not celebrating Thanksgiving! Soak 1 ¼ cup of raw cashews in 2 ½ cups water, with 1 tsp salt, and soak for 12-18 hours. Once soaked, preheat oven to 400 degrees. Drain the water from the soaked cashews and blend with food processor. Add one can of organic pumpkin puree, 1 cup maple syrup, and 2 tsp pumpkin pie spice to food processor and blend until smooth, adding salt to taste. Pour mixture into pre-made vegan pie shell and bake for 15 minutes at 400 degrees, then 35 minutes at 350 degrees. Cool and serve!